All of Georgia Tech’s colleges are highly ranked by national and world standards and, the Scheller College of Business is no exception. The school, which houses 1220 undergraduate students this semester, is ranked 1 out of 25 top business schools according to Business Insider, and the Princeton Review said that Scheller has the 5th best classroom experience. Since many of Georgia Tech’s students still don’t quite understand what they do over at Scheller, here’s a quick overview of the mysterious business school. Undergraduate students pursuing a Bachelor’s of Science in Business Administration start out taking a class or two a semester in a business-related topic in order to introduce them to the field. Later, they will choose a concentration in order to narrow their focus; they can choose from accounting, finance, information technology management, leading and managing human capital, marketing and operations and supply chain management. Tyler Harper, a first year with a finance concentration, is starting out his Scheller experience with a class in business law and loves it so far. “The professor is amazing. She used to be a lawyer, and she always brings in her own cases,” he says. “She really makes the course material come to life. Like many others, Harper has big dreams. After he gets established on Wall Street, doing investment banking or emergency acquisition, he wants to get involved in a start-up. Even between students who have the same concentration interests can vary Sam Medinger, a third-year who also has a concentration in finance, wants to go into corporate finance. “My favorite class so far has been my Intro to Finance class, which really solidified the fact that finance is what I want to do,” Medinger said. Medinger is on his third co-op semester working with the Southern Company’s treasury department. He helps them work with cash operations, debt issuances and deal with their operating companies, like Georgia Power and Alabama Power. He also is President of Scheller’s Student Business Ambassadors, which organizes both events for recruitment and for the undergraduate students. He might be a bit biased, but he likes to think that these programs help bring the school together. But why business at Georgia Tech, which is clearly an engineering and research institution? Many choose Scheller because of this very reason — it provides unique opportunities due to the integral role of technology in their education. “We are the cutting edge, and we have innovation centers all around us. Having a business school where there’s so much technology is very important, because it will be used forever in business and will only continue to grow and change,” Medinger said. 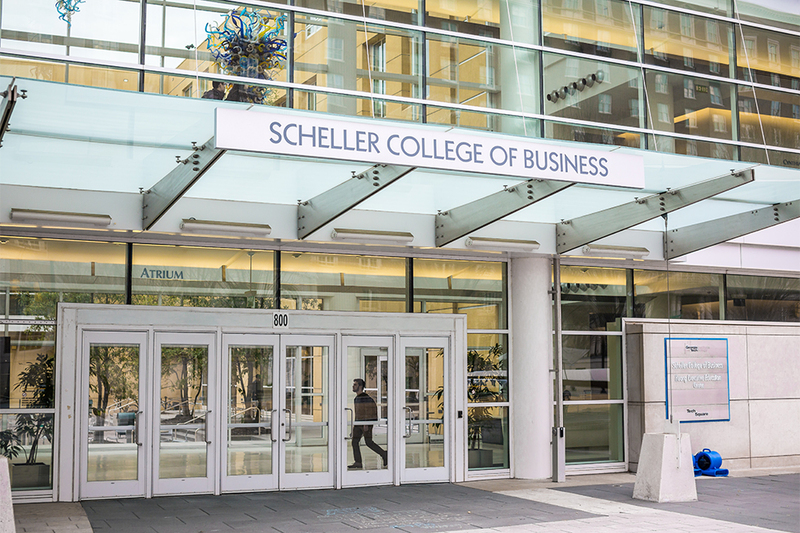 Scheller even tries to actively integrate the business and engineering colleges, through things such as the Technology and Management program. This minor in Computing or Engineering in Business is a two-year program where, each semester, business majors take an engineering class, engineering majors take a business class, and they take a joint class together. The students get the opportunity to develop diverse skills and work with their peers. Business at Scheller is one of many strong communities at Tech that have become firmly rooted in the university’s culture, much like Tech’s budding Literature, Media and Communications programs. It is here to stay, and its position makes it undeniably intertwined with the fields of technology and engineering.